If you’re running from the police, your pants are sagging, and you don’t have a belt you probably won’t get too far, as Michah Fitzpatrick soon found out. 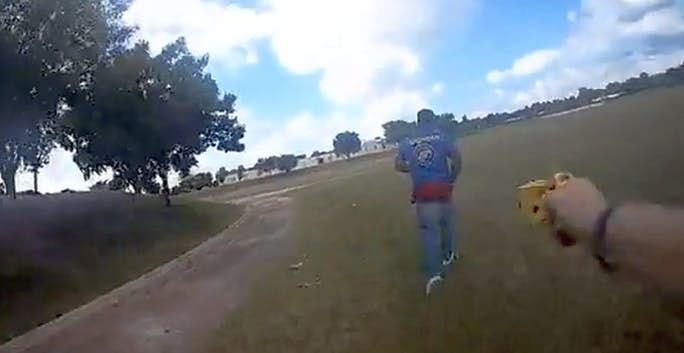 Tulsa OK Police tazed Fitzpatrick as he was running from them. Fitzpatrick was a suspected gang member and was found to be in possession of a handgun. You can read the whole story and watch the video by clicking here. On October 4th, 2018 New Haven Police Officer Thomas Murray had just finished his shift and was heading home when the truck he was driving was struck head on by a driver heading the wrong way on the highway. Officer Murray was driving his 2017 Chevrolet Silverado pickup when the crash occurred in the northbound lane of I-91 near exit 7, just before midnight, according to WTNH. It was determined by the Connecticut State Police that Katherine Gavidia was driving southbound in the northbound lane when her vehicle and Officer Murray’s vehicle collided head on. Both Officer Murray and Gavidia were trapped in their vehicles and had to be extricated by fire crews. Gavidia died from her injuries at the scene. Officer Murray was transported to Yale New Haven Hospital where he is being treated for serious injuries. He is undergoing surgeries for bilateral compound fractures of both legs, multiple fractures to his pelvis, many broken ribs and several other injuries. 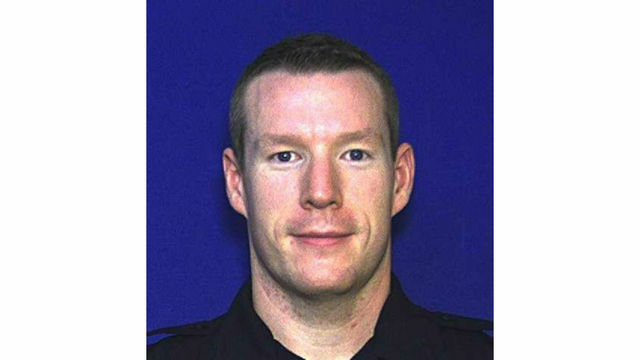 “The New Haven Police Department was saddened upon hearing of the serious injuries sustained by Officer Thomas Murray. Our thoughts, prayers and well wishes go out to him and his family during his time of recovery. We also wish to extend our sincere condolences to the family of the woman killed in this tragic crash and pray for comfort for all those affected by this sad event,” said Chief Anthony Campbell, who was with Murray’s family overnight at the hospital. Our thoughts and prayers for a complete recovery are with Officer Murray and his family. 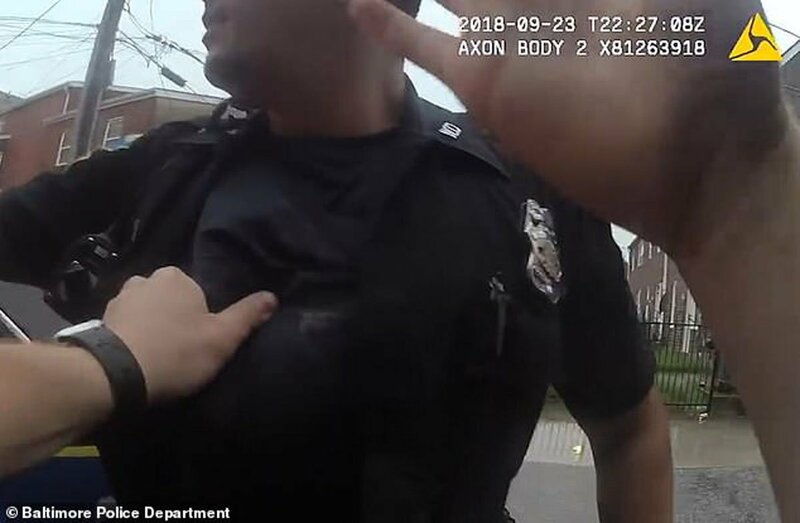 Baltimore Police Officer Steven Foster and Officer Phillip Lippe attempted to take a person suspected of dealing drugs into custody. The suspect shot at Officer Lippe and struck him three times, twice in the vest and once in the elbow. One of the rounds that struck Officer Lippe’s body camera. The suspect was armed with a SCCY pistol but was killed when the officers returned fire. Even having the gun was a violation of his parole. The suspect “was serving 20 years from June 2004 for second-degree murder, 5 years concurrent for use of handgun in crime of violence and 1 year and 1 day for second-degree assault,” The Daily Mail notes. He was paroled in January after serving the mandatory sentence. In Maryland, convicted criminals are required to serve half of their sentence. You can watch the video which captured the gunfight here. No one wants to make that deadly shot but sometimes that’s the only viable option to protect themselves and others. Click on the link here to read the article where five amazing shots were made by LEO’s. 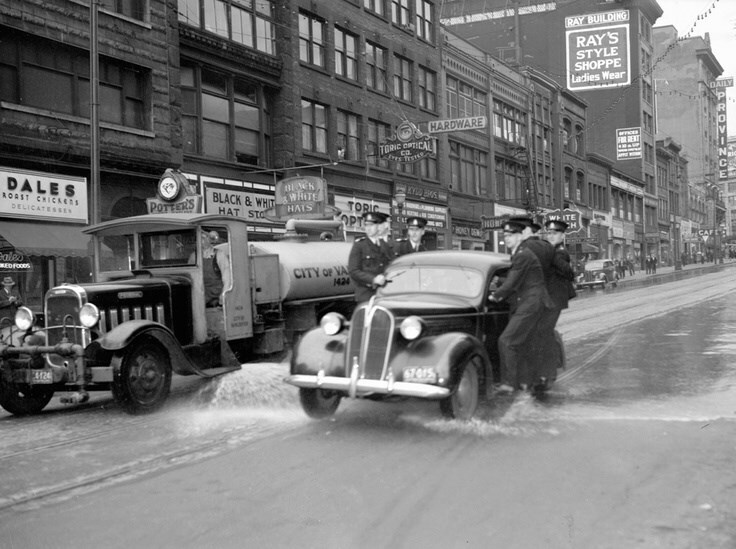 Make sure you read number five where Officer Clarence Koblitz was standing on the running board of a speeding squad car in pursuit of two inmates of a stolen car (1935). Thanks for everyone who came out this past weekend to help park cars at the Durham Fair! It was greatly appreciated and were were most appreciative for those who could only spend a couple of hours there as that was a big help as well. This year we were moved to the Tilcon lot which stretched our resources over a larger area. Everyone adapted to the situation as we normally do and things went rather smoothly for us. Thanks again and see you there next year! 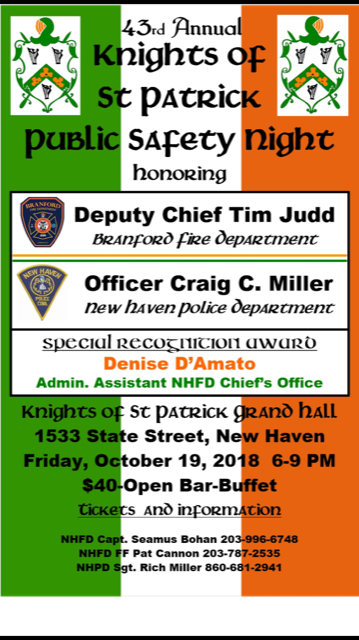 The Knights of St. Patrick are honoring Deputy Chief Tim Judd from the Branford Fire Department and Officer Craig C. Miller of the New Haven Police Department for their diligent devotion to the safety of the community they serve at the 43rd annual Public Safety Night on Friday, October 19, 2018 at the Knights of St. Patrick Grand Hall 1533 State Street, New Haven. Denise D’Amato, Administrative Assistant New Haven Fire Department Chief’s Office, is being honored with a Special Recognition Award. In April of 1976, John F. Walsh, newly-elected President of the Knights of St. Patrick, and club members exchanged ideas to honor the protective services of the City of New Haven. The meeting took place at the old clubhouse located at 304 Elm Street, New Haven. After some in-depth discussions, President Walsh suggested that a Public Safety Night be held. He asked Captain Donald McCarthy of the New Haven Fire Department and Lieutenant John O’Connor of the New Haven Police Department to serve as co-chairmen and to form a committee to run the event. On June 24, 1976, the first Public Safety Night was held. A New Haven Fire Fighter and a New Haven Police Officer were recognized for their contributions to the safety of the community they served. This affair was well attended with good club membership support and by a large group of individuals from both the New Haven Police and Fire Departments. Over the years, the honorees at Public Safety Night have been representatives not only from New Haven Police Officers and Firefighters but also from the Connecticut State Police, the FBI, and the State Judicial System. These individuals were chosen because of their diligent devotion to their duty in their particular organizations. The committee has also presented PSN Civilian Awards to individuals whose thoughtfulness and concern have helped Police Officers and Firefighters perform their duties. In July 1980, after serving on the PSN Committee, John Flynn was selected to serve as the Police co-chairman. He and Donald McCarthy of the NHFD along with long-serving committee members continued to keep PSN a popular club event. In 1996 both John Flynn and Donald McCarthy stepped down as Co-chairmen and were replaced by Detective Robert Brooks of the NHPD and Lieutenant David Morgan of the NHFD, along with Sergeant Joseph Weber of the Connecticut State Police. In 2002 New Haven Fire Lt’s Seamus Bohan and Brian Jooss joined Bobby Brooks as Co-Chairman when Dave Morgan and Joe Weber stepped down. 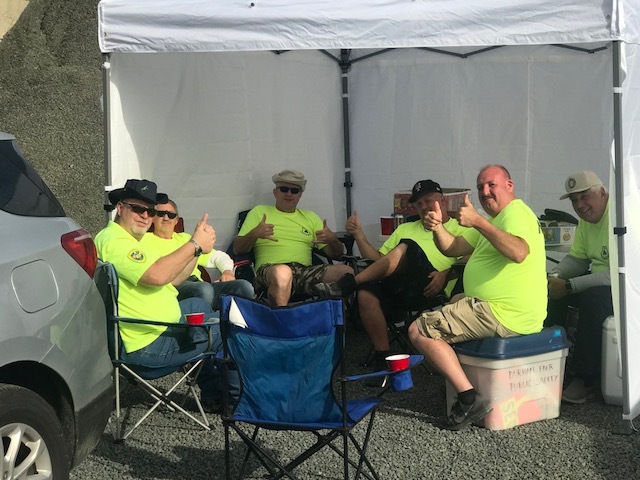 Since its inception, PSN has grown in attendance over the years and has become one of the premier special events of the Knights of St. Patrick. The future of this event appears bright through the efforts of the Chairmen, the Committee and the loyal support of those in attendance. Tickets for the Public Safety night are $40.00 per person which include a buffet dinner and open bar. For more information or tickets contact NHFD Captain Seamus Bohan, 203-996-6748, NHFD FF Pat Cannon, 203-787-2535, or NHPD Sgt. Rich Miller, 860-681-2941.